In saturday the 9'th april, I had some real plans to take my life. In friday evening, I almost were there. But a very good person on the Swedish biggest forum Flashback got me on other thoughts.. But then, saturday morning, I had some serously thougt about suicide. It seens that my landlord would kick me out. I counted my pills, cycled to the pharmacy and took out all my medicines. And I bought 70 cl Vodka. I haven't really clear memories from saturday marning... Probably because I had eat 10 sleeping pills and drank about 30 cl Vodka. But then had I tought to take over 500 mg of haloperidol, 240 mg clonazepam, 10 000 mg venlafaxine and much, much more. But I called my dad, my mom and my sister, to say goodbye. I think my dad called an ambulance, because they came here. When they came I was pretty cool, so they drove away again. Then my dad came, and my sister and her boyfriend. They had also called a doctor from FALCK who came home to me. He wrote me in at a psychiatric department in Helsingborg. It was really good in the department. Not particularly funny, exept some maniacs to smile at. But I felt very good there. The food was good, but I talked very little with the other patients. No changing in my medications. The whole thing was classified as; Acute stress-reaction. A ridiculous thing I noticed yestarday. 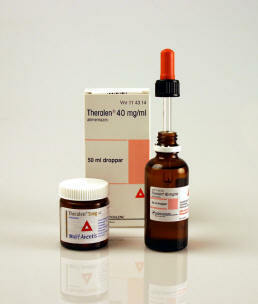 I'm taking a medicin called Theralen, the substance is alimemazine, a non narcotic sleeping agent, and a neuroleptic. This is a liquid medicine, and I have for some reason saved the empty bottles. The bottles is on 50 ml. If it is possible to store a teargas in this bottles, by a teargas-recipe I just found somewhere, and also if it was possible to do sarin-gas in the same procedure. Of course I hadn't plans to make som teargas, and lesser sarin-gas... I am just fascinated by dangerous things. And if it is possible to make it att home. The empty Theralen-bottles was taken from me. The bottles was just an example to store it. When I was heared yesterday, and I didn't had access to my apartment, I asked a policeofficer, that I must have my medicin. But no, I didn't get access to it. I'ts very importent that I take my medicin. Som is for schizophrenia, anti-axiety, anti-depression, and some sleeping agents. Now, it went good, but I think this is serious. I wonder if it is possible to do deny me my medicin. When I was aressted 2011, the police gave me all my medicines, about 500 pills in the arrest to handle by myself. But this time they don't let me have my medicines, two of them is classed as narcotics. If it was, for example, warfarine, I could have died! Yesterday, when I was biking at my work, a women stopped me, and show me her police-ID, then a police-bus came. They took me in for a hearing. Someone had toled the police that I have radioactive materials at home. I confirmed that I had some radioactive glas, with a very, very small amount of urainum in. But, I asume, rather safe than sorry... I went from the police-station to my work. They had tooked my keys and I was forbidden to got home. So I spend the night in my moms apartment. Then I biked to my work, and of course rumors was already there. I don't think they found nothing! I can't se that something is missing in my apartment, except my computer. But I was sad when I opened the door, and thougt that they had went upside down in all my things. But suprised, that almost nothing was untouched. There was nothing! I think I know, who tipped the police, and I will deal with that later. When I came home, the green glas was still where I've lefted it, my handgrenades-atraps was there, and if they found something I think they have told me!